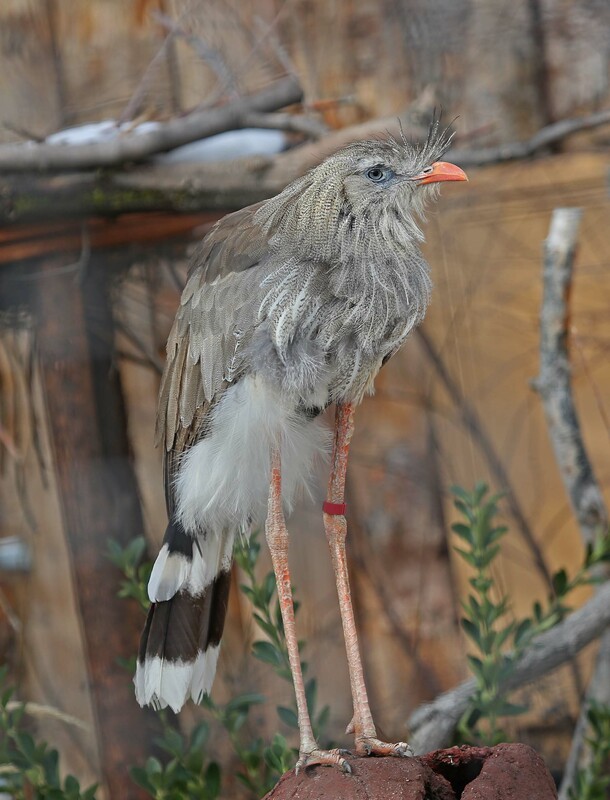 The Red-legged Seriema is found in South America. 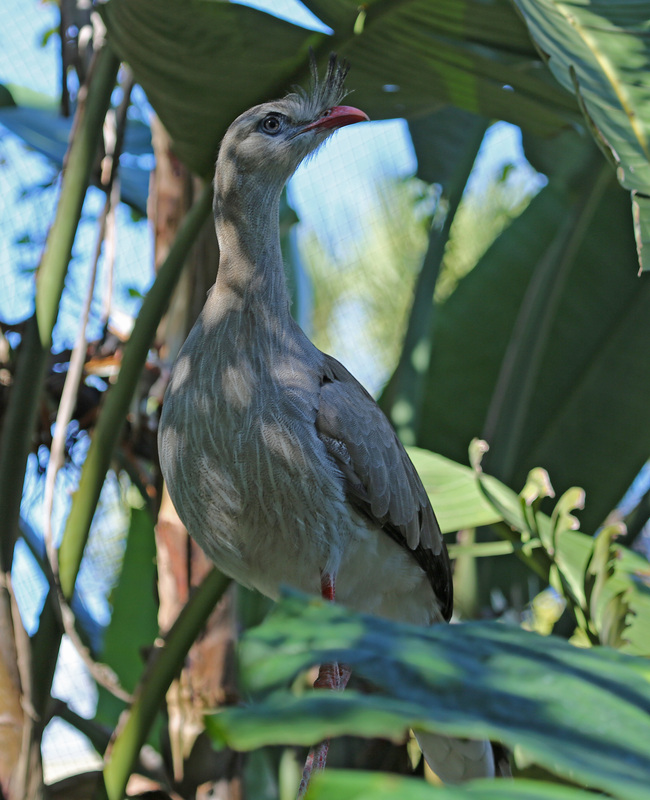 They were originally placed in the 'Gruiformes' order but they have been moved to a new order, 'Cariamiformes'. 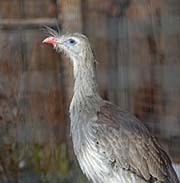 Their plumage is mostly made of up shades of grey and brown. The belly is white and the tail has broad black and white stripes ending in a white stripe. Slightly stiff feathers emerge from the base of the bill to form a fan-shaped crest which can reach 4" (10cm). Their eyes are yellow and surrounded by blue skin. The legs, feet and bill are red. Both sexes are similar but the male is slightly larger. 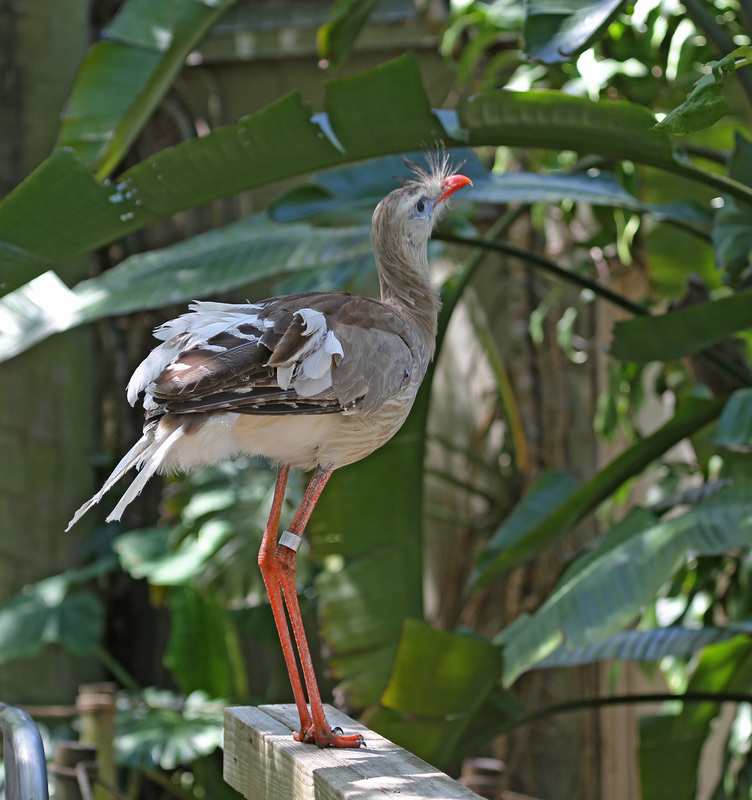 While they can fly short distances, they prefer to run from danger. Diet: Red-legged Seriemas mainly eat insects, small rodents, lizards, frogs and birds. They will also eat some seeds, fruits and cultivated crops such as corn, beans and grains. Small prey are swallowed whole, larger prey are torn apart while held between the sharp claws. 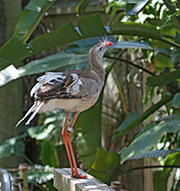 Courtship: Red-legged Seriemas are believed to be monogamous. The male's courtship display includes strutting in front of the female and stretching out his flight feathers and lowering his head to show off his crest. Nesting: Both sexes build the nest which is made of twigs and branches and lined with mud and leaves. The nest is built in a tree and can take a month to build. Usually two eggs are laid and are incubated by both parents who also care for the hatched chicks. Habitat and Range: Red-legged Seriemas are found in woodlands and grasslands from Brazil south of the Amazon to Uruguay and northern Argentina. They are also colonizing man-made grassy areas. Vocalization: Their call is described as a yelping puppy which can be heard miles away. Both sexes will sing together or alternately and chicks over two weeks old will join in. Tongue/feet: Reddish legs and feet. The feet have three short sharp front toes and a raised, slightly smaller hind toe.